Yorkshire Sculpture Park in Wakefield has won the Art Fund Museum of the Year Award, worth £100,000. Film director Sam Mendes announced the winner at the National Gallery in London yesterday. Peter Murray, founder and executive director of the sculpture park, received the prize. 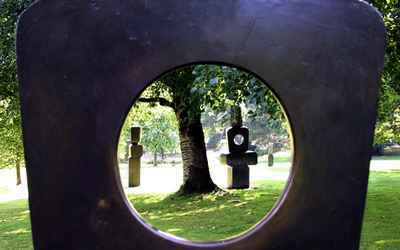 Shown is Barbara Hepworth's Family of Man, a series of sculptures in the park. If you fancy viewing modernistic tripe, there is no better venue than 500 acres of beautiful parkland. The other shortlisted museums were Ditchling Museum of Art and Craft, Hayward Gallery, Mary Rose Museum, Sainsbury Centre for Visual Arts and Tate Britain (CLICK).